See the sights from some of your favorite movies and television shows while you experience Manhattan like never before on this 2-hour bus tour, led by a local actor. Begin north of Times Square as you head to the Upper West and East Sides of the city, and stand in the same spots where stars such as Jerry Seinfeld, Billy Crystal, and Leighton Meester filmed iconic scenes from 'Seinfeld,' You've Got Mail,' and other classics. Visit Manhattan’s most famous TV and movie sites in two hours. Meet your group at 2pm outside McGee’s Pub, 250 W 55th Street—this pub was inspiration for MacLaren’s on How I Met Your Mother. Jump on the bus to get your 2-hour tour going, and scout out Trump Tower, the Time Warner Center, and the Maine Memorial as you ride. Your first stop is at Lincoln Center, where many celebrities have come to perform. The fountain in the plaza has been in movies like Moonstruck and Pitch Perfect. 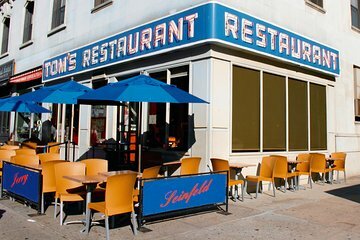 Next up is Tom’s Restaurant, known by Seinfeld fans as Monk’s Café—Jerry, Elaine, and George’s favorite meeting spot. Get out of the bus to explore Tom’s and snap some photos. Hop back on the bus and cruise down the edge of Central Park to the Upper East Side. Your third (and final) stop is at the Metropolitan Museum of Art, where you can sit on the same steps that Blair (Leighton Meester) of Gossip Girl did. Inside the museum is the Egyptian Room, where Harry and Sally realize their love for each other in When Harry Met Sally. On your ride back, pass other popular places filmed in movies such as Home Alone 2, Almost Famous, and Wolf of Wall Street. My teenage daughter and I were positively thrilled with the WHEN HARRY MET SEINFELD tour!!! Our tour guide, Max, was the greatest tour guide we've ever had the pleasure of dealing with... he was warm, friendly, courteous, and extremely knowledgeable about each and every aspect of the places we viewed and visited during this fantastic tour. Not just that, but Max was very amusing during the whole entire tour as he was doling out secret tidbits about Jerry Seinfeld and the gang, Meg Ryan, Tom Hanks, and even Michael J. Fox who wasn't even highlighted in this tour. Some, if not most of what Max revealed to us and the other tourists was truly amazing... things you would never have known about or been privy to unless you were on this tour. If you want to get the inside scoop on your favorite TV and movie stars, view and visit their old stomping grounds in which they brought us joy and delight not to mention, tears... on some occasions, if you want a fantastic tour guide, Max, to show you a fun time with his incredible and witty sense of humor and immense knowledge about virtually everything he discussed on this amazing tour, then do not hesitate or second-guess your decision to book it with VIATOR on your next trip to New York City or more affectionately known by locals and tourists alike, The Big Apple. This is an absolute, must-see, do-not-miss event that should be included in your NYC itinerary, most especially if you and your family or friends that are visiting NYC with you are diehard Seinfeld fans and/or Meg Ryan and Tom Hanks fans. You are gonna love it...trust me!!! And just like my daughter Jennifer and myself, you'll have such a great time that you will ALWAYS book a VIATOR trip no matter where your vacation plans take you!!! THANKS VIATOR...and a very special thanks to Max! Jen and I will see you soon!!! We enjoyed the bus tour very much. Lots of interesting information on TV shows and movies. Our guide Max was fun and very knowledgeable. Would of liked to maybe go inside more places if possible. Good length for tour.